On a warm sunny day in early autumn, I took the day off work and caught the train to Bath for an eagerly anticipated viewing of a new exhibition at the Victoria Art Gallery. The exhibition celebrates the work of Clifford and Rosemary Ellis, whose artistic partnership spanned five decades. Their creative output included book cover and poster designs and superb watercolours recording Bath during the Second World War. Clifford Ellis was head of the pioneering Bath Academy of Art, based at Corsham Court from 1946 and during this time Clifford and Rosemary Ellis, who signed their work simply as ‘C & RE’, produced work revealing a great love of the British countryside and its wildlife. Their images consisted of bold designs and fresh, bright colours which worked magnificently on the well known jackets of the New Naturalist library. After the death of their daughter Penelope Ellis in 2016, the Ellis Family art collection and archive was donated to the Victoria Art Gallery and Bath Record Office. 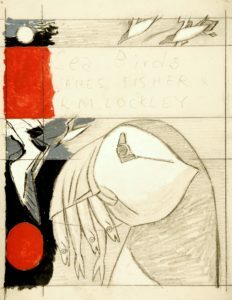 The collection consists of the wartime diaries of Rosemary Ellis, together with wonderful poster designs from the 1930s, striking watercolour landscapes and a stunning collection of sketches, final artwork and jacket proofs from the iconic New Naturalist library a selection of which are displayed in this exhibition. Clifford Ellis (1907-1985) and Rosemary Collinson (1910-1998) first met in 1931, in the art department at Regent Street Polytechnic. They were married within a few years, based in Bath, where Clifford taught design at the Technical School. Clifford Ellis became Head of Bath School of Art in 1936, which evolved into Bath Academy of Art, moving to Corsham Court in 1946. With Clifford Ellis as principal, it became one of the most innovative and vibrant art colleges in the country. Besides teaching, the Ellises developed a very successful design partnership, working closely together on posters, book jackets and wallpaper designs, often featuring imagery from the natural world. The distinctive posters that Clifford and Rosemary Ellis created in the 1930s were characterised by unusual and striking colour combinations with dynamic compositions and strong outlines. They knew the processes of offset lithography well and their fine art style was very much in tune with modern art movements at that time such as Post-Impressionism and Fauvism, often with a hint of abstraction. Clifford Ellis was hugely inspired by a painting by the artist Paul Klee, which he was shown by the art critic Roger Fry while he was at the Institute of Education. The painting featured text lifted from a poem and the combination of lettering and broadly brushed areas of colour would be played out in the many posters designed by C & R E. As the commissions accumulated, the Ellises became confident enough to suggest new ideas to publicity managers such as Jack Beddington of Shell, for whom they conceived the ‘professions’ series of posters. In one poster their sense of fun extended to painting two champagne cider bottles with their names on the labels. During World War Two, both Clifford and Rosemary created meticulous paintings of bomb-damaged buildings such as views of St Andrew’s and St James’ Churches and the Assembly Rooms in Bath. Although not official war artists, as eye witnesses and talented artists, they created a significant record of this time. Bath School of Art was severely affected during the war and as a result moved several time, firstly to Walter Stickert’s home in Bathampton, then to Sydney Place and finally to Corsham Court, ten miles from Bath, which was the home of Lord Methuen. He assigned one wing of his mansion to the Academy of Art made his collections available to art students. The first students arrived in September 1946 and for nearly 30 years Corsham, as it became known, was regarded as one of the best art schools outside of London. The Ellises continued their teaching and design work during the war and Clifford set up the Bath art Club, offering meetings and lectures by inspiring guest speakers such as Kenneth Clark, Nikolaus Pevsner and John Piper. Clifford and Rosemary Ellis both made work for the Pilgrim Trust’s Recording Britain project, with Rosemary concentrating on Bath’s grave yards. Her lyrical watercolours of the period are signed in her name, as are those of Clifford, for they chose different subjects. Interestingly, their respective styles are not dissimilar, both using sponges and thick paper to create texture. Clifford’s contribution to the Recording Britain project was to make paintings of Bath’s historic ironwork, thereby saving some of it from being melted down. He also made watercolours of the VE day celebrations in 1945. He contributed directly to the war effort by joining the local Home Guard and be devising large-scale camouflage schemes for the roofs of factories and dioramas for the training of tank crews. The poster and design work the Ellises created in the 1930s, as well as large scale mosaics and murals, had to take a back seat while teaching at Corsham. However, they continued to experiment in abstract oils and lithographs. At this time, Clifford and Rosemary Ellis were approached by the publishers Collins to design book jackets for a new series of books entitled The New Naturalist. 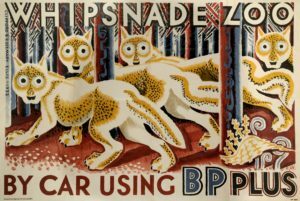 By this time they were already well known for their eye catching lithographic posters for The Empire Marketing Board and The London Transport Passenger Board in the 1930s. The Baynard Press was selected to print the book jackets, as they employed one of the best known lithographic printers of the day, Thomas Edgar Griffids. Under his guidance, the Ellises used only three colours and black, using tones and overlaps to produce more colours. The jackets were created using water based paints, chalk and wax on white paper and the Ellises were very exact with their instructions for the colours and the order in which they should be printed. The original artwork was often the same size as the jacket with separate artwork for the colophon and typography. In later years, the method of printing was modernised, but the artwork produced by the Ellises was always a joint effort, producing an attractive and striking result. They researched each jacket meticulously, visiting landscapes and habitats, making numerous sketches, before condensing their research into simple, bold designs that referenced the characteristic attitudes and shapes of their subjects. Correspondence with Collins shoes that C & R E were very exacting in their demands for faithful rendition of their original artwork. They designed in four colours or less, whilst the photo-litho process was used to convert the artwork into print. 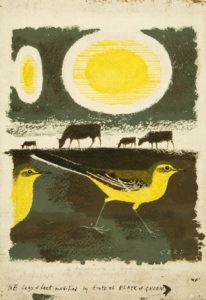 The editorial board sometimes asked the artists for corrections, as when James Fisher pointed out that the foot of the Yellow Wagtail should be flat on the ground as it ‘is lifted off in one movement’. Over 40 years, Clifford and Rosemary Ellis created over 90 book jackets for the New Naturalist library, the last one being for No 70, The Natural History of Orkney, which was published in 1985, the year of Clifford’s death. The Ellises book jacket designs contributed in no small way the huge success of the New Naturalist library. In 1965, Clifford Ellis put together an exhibition ‘Corsham Painters and Sculptors’ celebrating the work of artists who had taught alongside him at Bath Academy of Art. Originally developed for Bath Festival, the show subsequently toured to five public galleries around the country. The purpose of the exhibition was to celebrate and publicise the role of the artists who taught at Corsham, and to raise the profile of the Academy nationally. To show their gratitude for Clifford Ellis’ work on the exhibition, 15v of the artists involved worked together to create a special presentation set of their own paintings and drawings. Clifford and Rosemary kept some of these on display in their home for many years and they are now an important part of the bequest given to the Victoria Art Gallery by the Ellis family. One of the highlights is a portrait of Clifford Ellis by Howard Hodgkin. None of these works have ever been seen on public display. 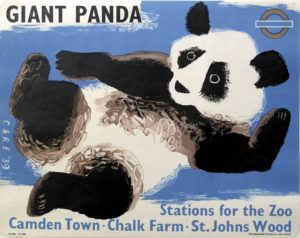 This superb exhibition features as broad representation of artworks by Clifford and Rosemary Ellis with wonderful examples of posters, book jackets, sketches and paintings. It is very well laid out with excellent interpretation written by Jonathan Benington, the manager of the Victoria Art Gallery. There is a beautifully printed brochure available which includes a detailed introduction by John Benington and over 50 pages of full colour illustrations depicting highlights from the exhibition, including 22 pages of New Naturalist related artwork. If you love the C & R E dust jacket designs as much as I do, this is a must see exhibition, an absolute treat and highly recommended.